Cannon County High student Jonathan House plays Taps as John Naylor, Chief of the West Side Volunteer Fire Department holds the microphone and Faye Morse, Cannon County Emergency Management Agency Director, looks on. 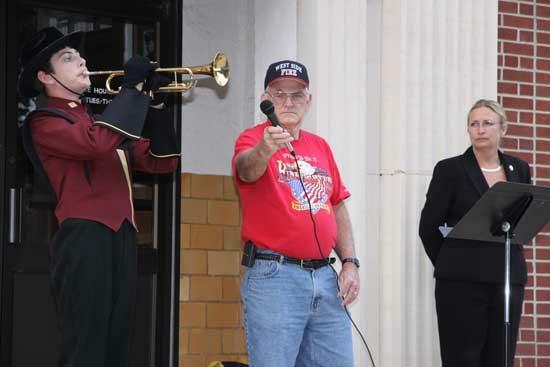 A 9/11 Candlelight Memorial Service was held Friday at the Cannon County Courthouse. John Naylor, Chief of the West Side Volunteer Fire Department and Vietnam War veteran, conducted the ceremony. "This candlelight memorial service is simply a small expression of our community's deep appreciation for the lives that were lost on Sept. 11. We would like to take this opportunity to honor those who continue to fight for our freedom," John Naylor said. The memorial honored those who have fallen and those who survived the 9/11 attacks, and those who have defended or are defending our nation now. Thank you Chief Naylor for showing your appreciation and support. Mostly THANK YOU for your service. Thank-you for appreciating us and not forgetting the reason we are here.